Check out our Facebook Page - here. Parkway Manufacturing and Machine Shop, Hampton VA is a local machine shop and Steel, Aluminum and Stainless fabricator located in Hampton Virginia. For those not in the area, this means that we serve the Tidewater or Hampton Roads area (also known as "Southside" and "Peninsula"). The Southside cities and communities served are Suffolk, Chesapeake, Portsmouth, Norfolk and Virginia Beach, VA. We also serve Isle of Wight County and Southampton County. On the Peninsula we serve Hampton, Newport News, Williamsburg, James City and York Counties as well as Yorktown, Grafton, Gloucester and Matthews County. Part of North Eastern North Carolina is also located in our local delivery area. including Elizabeth City, Gates County and Hickory as well as part of the Outer Banks area of coastal North Carolina. We have split our business into several divisions in order to serve each sector of the available work load. When required, this division is responsible for the installation of our jobs. 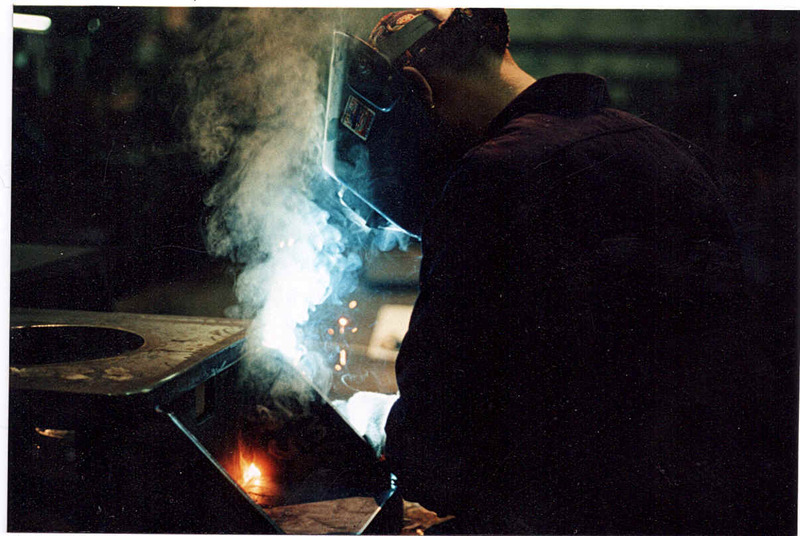 This division also provides "by the hour" on-site contract welding and fabrication. This division gets involved in many local ornamental iron and architectural steel projects. We can handle projects as large as commercial buildings to a simple porch, deck or stair railing. Fully supported by our in-house fabrication team the Field Fabricators allow us to offer complete drawing to finish project support. Our Field Fabrication experts also provide many on-site repair services. This division is responsible for the complete fabrication of all ornamental iron, architectural steel and structural steel projects that enter the plant. With daily coordination with the Field Fabricators we always have a smooth transition between projects. We also provide many safety related items such as Bollards, Commercial Hand Rails and Curb Guards. Our special applications are also handled by this group. They design and manufacture items like this add on truck bed. This division's main responsibility is to provide fabrications that will be later machined in our machine shop. Most of these projects are sub-contract items that are a component of another manufacturer's equipment. We fabricate gear boxes, motor adaptors, machinery foundations, brackets and many other machinery parts. This division is also responsible for all prototype projects. This division also handles all our machinery rebuilding and repair work. The machining division is responsible for machine shop functions such as complete machining on items suitable for our machine tools and subcontract machining for items too large for our equipment. 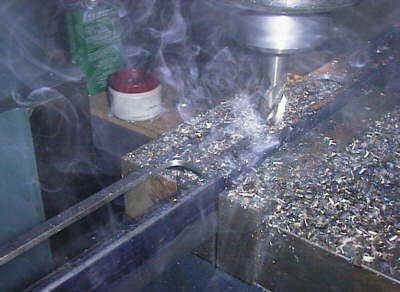 They also provide pre-machining support for the fabrication divisions. This division provides all the contract torch cutting, plasma cutting, plate rolling and bar sawing. We are used by many local machine shops as a source for low volume processed plate and bar stock. This division is responsible for producing our Abrasion Resistant Wear Plates. These wear plates are used in concrete mixers and in concrete batch plants. We have both traditional and AutoCAD based systems in house. For more complex projects we have a list of vendors we have used and trust. Our wear plates are custom manufactured to your drawing or sample part. We stock and manufacture AR235, AR400F & AR500 Abrasion Resistant Steels. We stock both 3/8" and 5/8" thick plates in both grades. Our torch and plasma cutting is CNC controlled. This enables us to keep your plate configuration available for use again and provide the identical product every time. For chute and mixer wall plates we can custom roll up to 1/2" thick x 48" wide. Our engineering department can plan your part from an emailed AutoCAD file. We can work with .dwg or.dxf drawings. If an approval drawing is needed we can provide that as well. We currently provide shipping throughout the United States, Canada & Mexico. We can use your preferred carrier or ours. We can ship prepaid and add to your invoice or ship collect. We manufacture machinery foundations, both simple and complex, to your drawings. Some of the simple foundations can be made from a sketch or description. An example is "Pump Mounting Plate" 2.25" finish thickness, 24" square with a centered clearance hole 16" in diameter. Include four anchor holes, one on each corner, 7/8" in diameter. Include four pump mounting holes, centered on the sides, 5/8"-11 tapped through. One face must be machined flat within 0.010" The mounting holes are set in 1-1/2" from each side and the pump mounting holes are on a 18" bolt circle. A simple sketch will insure a correct part. We can email back an approval drawing if needed. A complex drawing can be emailed in AutoCAD .dwg or .dxf format. We manufacture complex fabrications using structural quality ASTM A-36 and ASTM A-500 material. Our welding is to ASTM D1.1 We can provide a certificate if needed. We also can provide typical material certs if needed. 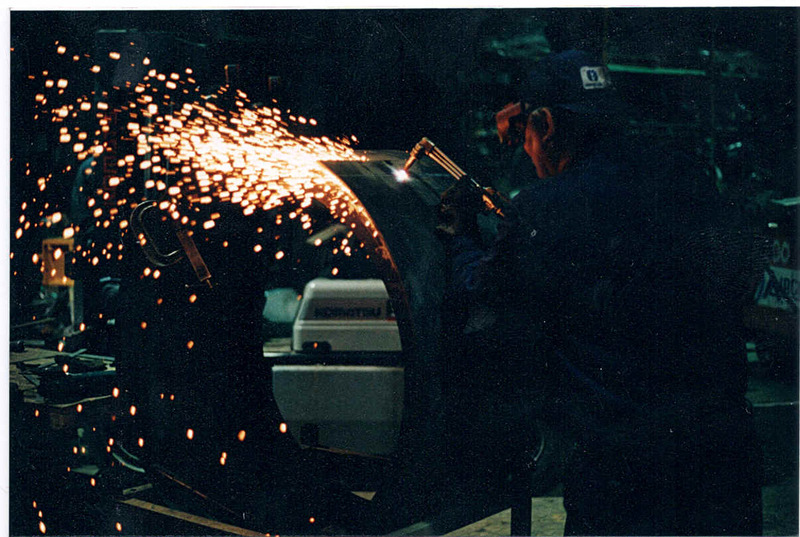 Our Machinery Division fabricators are experienced in maintaining most flatness and dimensional requirements. We can provide pricing and delivery quotes for fabrication only or complete parts. We have many other special services which we can provide. Email or Call. Our work is quoted at a competitive cost. We offer several ways to price your job. We can quote a rate to complete your job on a time & material (T&M) basis. We can provide you with a written estimate based on your sketches and drawings. We can provide a "not to exceed" estimate based on the current design of your job. All quotes expire after 30 days unless a longer time is agreed on at the time of quoting. We accept Master Card, Visa, American Express and Discover Card as well as cash and check. We will set up charge accounts for our regular customers, with "net 30 days" terms, after credit approval. Parkway Mfg. is located at 707 Industry Drive in Hampton, Virginia in the Copeland Industrial Park and close to Interstate 664. From Portsmouth, Chesapeake, take I-264 or I-64 get on I-664 North toward Newport News and Hampton VA. Cross the Monitor Merrimac Bridge. Get off at the Aberdeen Road Exit and make a left at the bottom of the ramp. Take Aberdeen Road to 60th Street and turn right. The next left is Industry Drive. Parkway Manufacturing and Precision Machine Shop is on the left before the Ryder Truck rental. From Downtown Suffolk, take US 58 to I-664 North to Newport News and Hampton VA, then follow the Norfolk, Portsmouth, Chesapeake, and Virginia Beach instructions to Parkway Manufacturing Inc.
From Norfolk or Virginia Beach either take the Interstates to I-664 and follow the above directions or take I-64 West thru the Hampton Roads Bridge Tunnel and then I-664 South, toward Newport News and Hampton VA. Get off I-664 at Aberdeen Road and turn North (toward Mercury Blvd.) at the bottom of the ramp. Take Aberdeen to 60th street and turn Right. Industry Drive is the next Left and Parkway Manufacturing Inc. is on the left before the Ryder Truck Rental. From Richmond, Newport News, Hampton, Williamsburg, or Yorktown, take I-264 East to Newport News and Hampton VA to I-664 South, then follow the directions from Norfolk to Parkway Manufacturing, Inc.